The fourth film by actor-turned-director Scott Cooper (Crazy Heart, Black Mass), 2017's Hostiles continues the second (third? fourth?) wind of dark, brooding contemporary Westerns in the wake of Unforgiven. 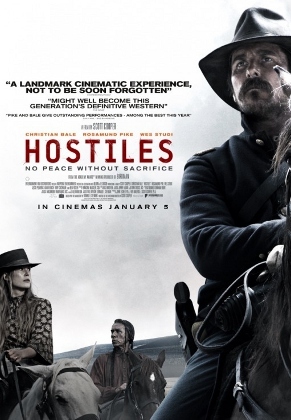 Set in 1892 New Mexico, Hostiles follows several Americans recently united by fate under tragic circumstances. Chief Yellow Hawk (Wes Studi), recently stricken by cancer in his later years as a prisoner, will be escorted home to Montana by Captain Joseph Blocker (Christian Bale), who has lost men at the hands of Yellow Hawk and his tribe. Meanwhile, settler Rosalee Quaid (Rosamund Pike) mourns the death of her husband and three children, recently killed by Native Americans, before she's taken in by Blocker and his men en route to Montana. Needless to say, theirs will be a long, dangerous journey and not everyone makes it there safely -- not only due to outside forces, but hatred within the group. Based on a story written by the late Donald E. Stewart (The Hunt for Red October, Patriot Games, Clear and Present Danger) more than thirty years ago, Hostiles was resurrected by Cooper for its thematic similarities to present-day America. It's a chaotic, slow-burning, and violent film -- not overly graphic considering the subject matter, but the film's near-complete commitment to bleakness isn't as repulsive as first-time viewers might expect. 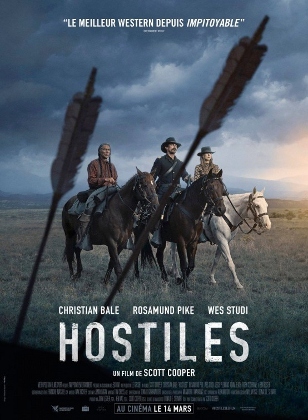 Though certainly without a great number of sympathetic characters, Hostiles bases its narrative on two opposing cultures briefly united by two specific events: the assumed death sentence of Chief Yellow Hawk and the sad tragedy of Rosalee Quaid. Anyone with a pulse can predict that each side might eventually learn to accept the other, but it's done so in a natural and believable manner thanks to strong performances by its lead and supporting actors. Bale is particularly good here: he brings a quiet, thoughtful presence to his character, with a gradual shift in tone that's neither rushed nor drawn out too long. Hostiles is the second of what will likely be many collaborations between Cooper and Bale; their previous film together, 2013's Out of the Furnace, explored similarly dark territory in a vastly different setting. Yet both films also share two more similarities: (1) a gradual pace that's occasionally hampered by too many detours, and (2) a few unnecessary supporting characters. Here, though, the problems are less evident despite Hostiles' slightly longer running time, and it's largely due to the film's outstanding cinematography. Shot on film in New Mexico by DP Masanobu Takayanagi, the wide-open landscapes are framed beautifully and add to the film's potent atmosphere; at times, they're strong enough to carry the film without words. That's a good thing, too, because Hostiles is unusually light on dialogue for a film with so many supporting characters, and the words that are spoken rarely reach above normal conversation level. Grim, unpredictable, and emotionally layered, Hostiles is the kind of film that drops first-time viewers in the deep end and numbs anyone hoping for a stronger sense of security. 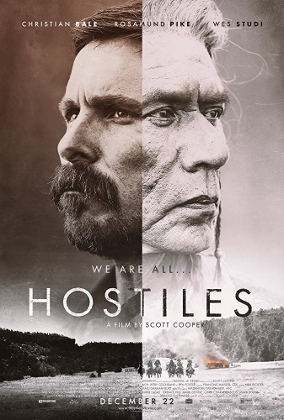 It offers no easy answers and very few sympathetic characters, but has the good sense to avoid traditional boundaries of good and evil: no one's completely without fault here, so "choosing a side" is almost irrelevant: Hostiles is obviously more concerned with showing us the whole picture, which will likely give it a lot more staying power than most in the genre. Lionsgate's new Blu-ray combo pack offers a top-tier A/V presentation and only one substantial bonus feature -- but considering the film's lackluster box office performance (a holiday release? ), it's a fine package that should draw in plenty of new fans. Presented in its original 2.39:1 aspect ratio, this 1080p transfer of Hostiles looks absolutely beautiful from start to finish. Shot on film by noted cinematographer Masanobu Takayanagi (The Grey, Out of the Furnace), its New Mexican locales are wonderfully captured and, more often than not, look impressive enough to just randomly pause and admire. Colors are extremely natural with accurate, even skin tones and a strong palette that varies between almost sepia-toned indoor moments to bold, sun-baked outdoor landscapes. Image detail and textures are quite noticeable at times, with excellent contrast and deep blacks that rarely get lost in shadow. It's one of the rare new releases that makes me wish I owned a 4K player for direct comparison, because Hostiles is one great-looking film that's been ported perfectly to disc. No obvious digital imperfections could be spotted either including banding, black crush, excessive noise reduction, or compression artifacts. Without question, established fans and newcomers alike will be really impressed here. Not to be outdone is the default DTS-HD 5.1 Master Audio track -- and while Hostiles' end credits list a Dolby Atmos master (which usually guarantees a 7.1 mix on home video), this slightly dialed-back presentation is no slouch with an extremely wide soundstage, plenty of well-placed low frequency effects, strong channel separation, and clear dialogue with a few mild exceptions. As Hostiles can be a very subdued and near-silent film at times, there's a great contrast between more chaotic moments; better yet, it's mixed well and won't force you to reach for the remote constantly. Optional English (SDH) and Spanish subtitles are included during the film only, while various Native American dialects are paired with burnt-in English subtitles that likely match their theatrical counterparts. I'm not a big fan of Lionsgate's home video interface in general: the loading time is quite slow, there are a lot of unskippable warning screens and logos, multiple forced trailers, and a rather sluggish menu that always feels a half-second behind my remote. But at least there's a handy "Resume" function, which eliminates most of that after the first go-around. This two-disc release (one Blu-ray, one DVD) arrives in multi-hubbed eco case with a matching, poster-themed slipcover and a Digital Copy redemption slip. Just one, but at least it's substantial: an hour-long Behind-the-Scenes Documentary that's divided into three parts. Featuring participation and appearances from principal cast and crew members including director Scott Cooper, cinematographer Masanobu Takayanagi, actors Christian Bale and Rosamund Pike, costume designer Jenny Eagan and others, it travels the usual territory (development, shooting, production design, etc.) but does go into good detail at times and, like the film itself, is visually impressive and well-produced. I'll admit that it spends too much time back-patting director Scott Cooper; the surface-level praise gets old quickly, but the good material here far outweighs the bad. Still, the lack of additional extras is slightly disappointing -- not even a trailer or poster gallery? Slow-burning and almost uncompromisingly bleak, Scoot Cooper's Hostiles begins with a nightmare and rarely lets up on the bad news. The film's potent atmosphere, aided by excellent locations in New Mexico and strong cinematography, remains captivating and really draws in first-time viewers...but you'll want to stay for the excellent performances and memorable characters, as well as an ultimately hopeful ending that offers a much-needed sigh of relief. This isn't exactly a perfect Western -- it's a bit naval-gazing at times and could have benefited from more judicious editing -- but does a lot more right than wrong, at least enough to make it worth a good look on home video. Videophiles may want to opt for the separate 4K release (this was shot on film, after all), but Lionsgate's Blu-ray combo pack still offers an outstanding A/V presentation and an hour-long behind-the-scenes documentary. Recommended. Randy Miller III is an affable office monkey by day and film reviewer by night. He also does freelance design work and runs a website or two. In his limited free time, Randy enjoys slacking off, juggling HD DVDs, and writing in third person.